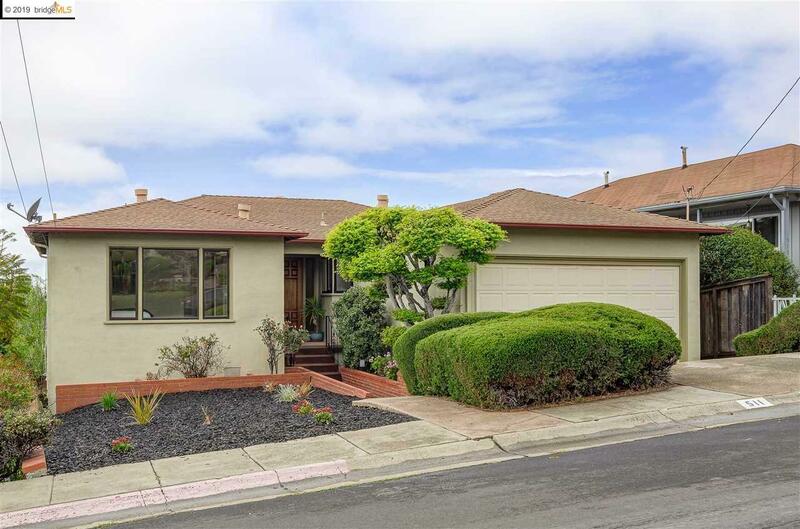 Located at the base of the El Cerrito hills, this wonderful three bedroom, two bath home offers lovely views of the bay and Golden Gate Bridge and close proximity to the El Cerrito Plaza, BART, parks and schools. Enjoy a light filled floor plan that offers lots of flexibility. The main level has two bedrooms, one bathroom, a generous eat-in kitchen with access to the two car garage. The lovely living and dining area features a corner fireplace and sliding glass doors to a large rear deck with a seating area in which to enjoy the lovely views. The lower level has it's own entrance, one bedroom, one bathroom and a lovely open kitchen/family room space with sliding glass doors out to an expansive brick patio area with a view of the Golden Gate. This home is perfect for an Au-pair set up or multi-generational living.